Posted October 11, 2017 by Bailey Heard & filed under Blog, FeaturedOnHomePage. Does perfectionism paralyze you from finishing projects and reaching your goals? That’s a resounding yes for me. Recently, my mom insisted I read a book called Finish: Give Yourself The Gift Of Done by Jon Acuff. I’d read his book, Start, a couple of years ago and really liked it, so I was looking forward to downloading his latest work. It did not disappoint. In fact, I think it’s so valuable I want to share some nuggets of wisdom with you! He starts by saying 92% of New Year’s resolutions fail, not because of laziness, but because of perfectionism. We are often our own worst enemies by telling ourselves if we’re not going to do something right, then we won’t do it at all. Jon says that’s why we’re most likely to quit on day two of our goal or what he calls ,“the day after perfect,” because our results don’t live up to our expectations. Jon’s solution, after some research conducted by a university researcher with hundreds of participants, is NOT that we work harder, but that we ELIMINATE the pressure to be perfect. According to Finish, we do this by having more fun, eliminating our secret rules, and choosing something to bomb intentionally. He put this theory to test and, according to his research, those people who made their goals fun were 46% more successful. The key he shares is you have to be deliberate about making your goals fun. One thing I recently did to make my goals more fun was to find a new office space. I’ve always worked out of my home office, but after listening to this book and Gretchen Rubin’s book, The Four Tendencies, I realized how working at home for me can ignite my perfectionism. I start to work on all kinds of household projects instead of accomplishing my personal goals, so in order to eliminate distractions and give myself some much needed accountability, I found an office, bought a yummy smelling candle from TJ Maxx, and created my own inspiring work space! Jon discusses how we think we have to have huge goals. We go big or go home. His solution is to cut our goals in half. By doing this we we’ll usually hit over our goal, which will make us feel successful, and will keep the momentum going to continue working on our goal. He suggests that if you want to win, go small. 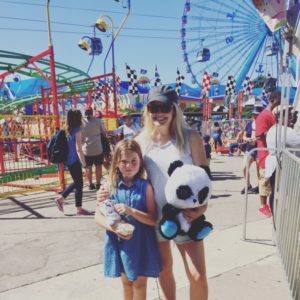 As a single mom, I often feel like everything hangs on my shoulders— from all things household, taking care of my little girl, providing financially for my family…the list never ends. I often feel like I have to stay on top of all of it or my life will crumble. I put a lot of pressure on myself to keep everything in our world moving, which often leaves me feeling drained and exhausted because, according to Jon, we can’t do it all. He says when we start a new goal, we have to remember that also means we have to quit something else. Instead, we just add and add and add until our days are full and we are completely overwhelmed. His solution is to pick a handful of things you know you will bomb, for the time being, while you’re working on your big project or goal. I applied this principle through delegation. In last weeks post, I shared how I hired someone to come in the mornings a few days a week to help take care of household chores and get Ellie ready for school. That way, I could go exercise and get started on my career goals immediately after dropping her off at school. I’d love to know which principle most spoke to you and what’s something you can do immediately to apply it to your goals? I hope you found this post helpful. For more on the book and Jon Acuff go to https://acuff.me/books/ Thank you so much for spending time with me today! So grateful. Love and Blessings.